"Authored by a 'who's who' roster of governance experts, Boardroom Realities covers the latest trends in board leadership and performance as well as talent management for the board and the C-suite—all critical topics for any director serious about board service today." "If leadership and effectiveness in the boardroom were important in a more benign environment, they're absolutely vital in today's tumultuous times. 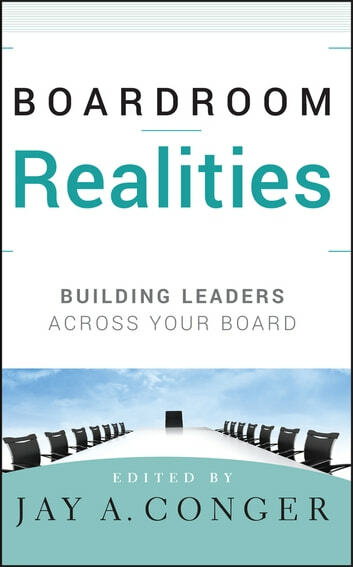 Boardroom Realities provides a modern and detailed road map to help steer chairmen, CEOs, and boards through these uncharted governance waters." "Jay Conger's Boardroom Realities offers a unique perspective on governance through leadership, rather than compliance, and should compel all directors to revisit the focus of board deliberations, especially at this time of unprecedented economic and financial turmoil." —Alison A. Winter, cofounder, WomenCorporateDirectors, and a corporate director for Nordstrom, Inc.
"Boardroom Realities is a very comprehensive compilation of useful insights on key issues that boards must deal with every day. It's an excellent resource for board members as well as members of management who must work together to ensure good governance on behalf of shareholders." "Jay Conger has collected critical insights and the latest thinking on board leadership from many of today's foremost governance thinkers. 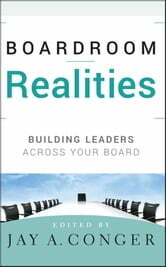 Boardroom Realities is a must for your board and for any comprehensive corporate governance library."